Cogmap2's Courtroom has been forcefully assimilated into the Chapel, as if it has some sort of divine judgement thing going on. See the Chapel page for the relevant info. In theory, people practice law here. In reality, people practice bombs here. Located in the western part of the station, along the main access-way to the bridge. Theoretically where trials would take place, but those rarely happen, and when they do, they will inevitably be bombed. 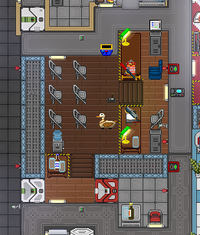 Officer Beepsky begins his day here. This is the NSS Destiny's own Courtroom, located just across the hall from the Security Department. No, it doesn't matter what the map says, this isn't the PTL Room. It's not a place where a giant heat laser is housed, it's place of LAW AND ORDER, and the only heat here is the heat in the air of a real courtroom drama and explosion of the bombing that'll inevitably happen here. That, folks, is what those legal closets and refreshments are here for. Because when the arguments and counterarguments and objections and interjections are flying all over the place like a drunken bar brawl, and the witness questioning is heating up hotter than the Chaplain's crematorium, you betcha you want a drink. This peculiar little space towards the southern end of the station is Mushroom Station's very own Courtroom. Not that you'd be able to tell from first glance; much of it is just hallway space, and the jury box and defendant chair are basically smushed into the corner as an afterthought. It's as if this room was never designed to be a courtroom in the first place. Officer Beepsky begins his day here, in his own little broom closet of an apartment. Tanhony, the Paper-Hatted One, is his neighbor. There is no vent here. You could say this courtroom has no atmosphere. The APC for this room is on the north wall of the jury box, the room with the ten chairs. It's pretty much the only way, aside from the legal closets, that you'd know it was courtroom. The Courtroom is where the station's inmates go to hold trials. You can tell they really care about their courtroom affairs, because, unlike other stations, the Courtroom is in an actual room, located in the southeast/starboard side of the station, that genuinely looks like a courtroom. There's a little glass box for the defendant, a tiny little table for a lawyer, a little side room for six jurors, and a huge judge's box. The Head of Personnel is usually designated to be the judge, which is why there's plenty of HoP goodies in the judge box, like an ID Computer and a personal equipment manufacturer. Also, prisoners from the Brig are usually released from that chute right of the jury box. You can usually trust them to treat Tanhony nicely. Only model prisoners or petty criminals are released; the murderous ones are usually killed dead in their tracks or sent to the execution chamber. There is no vent here. This courtroom has a nice atmosphere regardless. The APC for this room is on the southern wall of the jury box, the room with all the chairs. 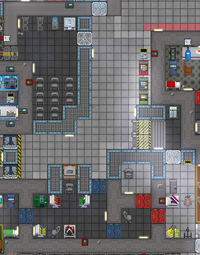 This peculiar little place awkwardly sandwiched between the Medbay, Security, and Customs is the outpost's own Courtroom. You can tell it's a courtroom because there's a windowed area with 9 chairs for a jury, a few closets with lawyer suits, an isolated defendant's chair accessible from Security for the defendant, and...nowhere for the lawyers. The hallways perhaps? Standing in the chair with the defendant? Who knows? Barely anybody on this rock has even heard of a trial, much less the proper procedures for one. There is no vent here. You could say this courtroom has awful atmosphere. The APC for this room is in the local maintenance room a bit northwest of here, accessible via the jury box. This pristine wooden room below Customs is the Courtroom, which has been rented to the station by the distinguished Lord Beepingshire. The crew are supposed to hold trials and hearings and such here; hence the judge's wig and robe, the gavel and block set, and the eight stools for eight jurors. However, in practice, no one, especially not the Lawyer, has the slightest clue how to run a trial, so usually everyone just straps some poor crook in line for execution anyways to a chair and scream random arguments at each other until some Traitor decides to time to silence them forever with a bomb. There is no vent here. You could say this courtroom has awful atmosphere. Not no atmosphere--that's only after it's been bombed. The APC for this room is on the top wall, near the wooden table. This page was last modified on 23 December 2018, at 05:27.